The series of weekly driver interviews continues with Simon Pagenaud, who drives for Team Penske in the Verizon IndyCar Series. These interviews are recorded as a podcast, but also transcribed for those who prefer to read instead of listen. I just had one last night, actually. We’re doing some experiments and I dreamt that I was driving it. When I was a kid, I used to dream of driving a lot — almost every night. I used to put myself into the thinking mode as well, hoping I was gonna dream about it. For me, personally, I don’t talk with the others. I know we’re all different. I feel like if I did something wrong and I know it’s completely wrong and it was my fault, I always apologize. Because I want to others to know that when I’m going for it and I’m in my right, I’m in my right. For me, the biggest would be the dedication. When someone tells me that they’re impressed how dedicated and professional I am, that’s the biggest compliment I could take. 4. IndyCar comes to you and says, “Hey, we are bringing a celebrity to the race and we’re wondering if you have time to say hi.” Who is a celebrity you’d be really excited to host? There’s a lot that I’d like to host. I think one I really would like to meet and have come to the race is Jimmy Fallon, actually. I really enjoy his show and his personality seems like we could get along pretty well, so I’d love to have him here. Have you ever gotten to go on any late night talk shows like that? No, I haven’t. I haven’t had that opportunity, unfortunately. I hope I will someday. 5. In an effort to show they are health-conscious, IndyCar offers the No. 1 pit stall selection for an upcoming race to the first driver willing to go vegan for a month. Would you do it? I mean, anything for a little advantage. But it would be very hard for me because I do love my chicken, my meat. It’d be a tough month. But I’d probably do it, yes. Is the No. 1 pit stall a big advantage in IndyCar? It is an advantage because you get a straight out. You can go straight out, you don’t need to swing around somebody. So there’s a bit of an advantage to that, yes. This is the 2014 Long Beach Grand Prix, since we’re here at Long Beach. I was with Schmidt. I’ll try to remember the color of the car, that helps me. ’14 —was that the Lucas Oil? No, it was the Charter car, I think. Yeah, it was the Charter car. I think that’s the race I got into it with Will (Power), so I finished fifth. Yes, you did finish fifth. (Laughs) Which was a really good recovery. You started sixth. You finished fifth. Mike Conway won and Juan Pablo Montoya finished just ahead of you. It’s OK. Part of it. Eminem. No question, in my mind. 9. IndyCar enlists three famous Americans to be involved with your team for one race as part of a publicity push: Taylor Swift, LeBron James and Tom Hanks. Choose one to be your head mechanic, one to be your spotter and one to be your motorhome driver. I’d put Tay-Tay as my head mechanic so she can send me on track. She can do that really well, I’m sure. LeBron James, I’d put him as my bus driver because then we could have a little chat afterwards. Yeah. He would be really good motivation before the race, too. He could massage me, too. My bus driver actually massages me. He’s a chiropractor. LeBron knows about sports science. I’m sure LeBron could do that. It’d be good preparation. And then yeah, so strategist would be Tom Hanks. I think he’s a really smart guy, so terrific. I always make sure I know where it is. It’s funny; I don’t even think about it, but I always check where is it depending on my grid place. It’s second nature. But there’s also another thing — when you step off the truck after the parade lap, just follow another driver. Yeah, exactly. We’re usually all going to the same place. 11. As you know, Carl Edwards used to do backflips in NASCAR. Is he still doing it, do you think? On the farm? Yeah. So IndyCar wants their own backflipper. By the way, my mother-in-law was really upset he retired. Oh yeah. She was really upset. Who did she move on to? So IndyCar decides it wants its own backflipper after a race. How much money would they have to pay you to backflip off your car after your next win? He said he might be the most punchable face after asking that. Yeah, he’s become the most punchable face. Exactly. Let me punch him the next time I see him. I actually would agree with him. I think because we have so much grip on IndyCars that finding that limit is a little easier than NASCAR — where the limit is so early on for them, they always have to always drive under. And it’s very hard for a driver to drive under the limit, because we always want more. I do think it’s easier when you have wings to find that grip level and extract the best out of it. When you have very little grip, you’re always on the edge. So I think that’s the reason. Also, their cars are heavier, so it’s harder to manipulate, and they have very strong competition — which we do, too. But that would be the reason I think: the grip levels of the cars, the tires are skinnier on a NASCAR, heavier car. It’s a bigger machine to move around. My next interview is with Jimmie Johnson. Jimmie Johnson! Do you know he’s one of my favorites? Wow, that’s cool! And his brother is one of my best friends. But I do not know Jimmie. You don’t know Jimmie personally? No, I don’t. Yeah, I do hang out where he grew up actually because Hailey (McDermott), my fiancee, she’s from El Cajon. They all know each other there, and Jimmie used to live in El Cajon when he grew up. Do you have a question I can ask Jimmie? So Jimmie’s got eight championships, right? Seven? I thought he had eight. Foreshadowing! So, “For your eighth championship, Jimmie, what are you gonna do different when you celebrate, and what was the most epic moment during your celebration of your first seven?” I’d like to know that. Guess what race is on Sunday right after the Chicagoland race on the same channel (NBCSN)? Yep, it’s the Verizon IndyCar Series season finale — a race which will decide the championship from among six eligible drivers. Sonoma Raceway is the 17th and final race of the IndyCar season, and six drivers can still win the title. They are the four Team Penske drivers — rising star Josef Newgarden, defending series champ Simon Pagenaud and veterans Will Power and Helio Castroneves — plus four-time series champion Scott Dixon and 2016 Indy 500 winner Alexander Rossi. Before answering that, let’s take a look at the current driver point standings. Those have been updated after Saturday’s qualifying session, because IndyCar awards one bonus point to the pole winner — and Newgarden put down a monster, track-record lap to start from P1. Still, it’s tough to say who has the edge right now. In Friday’s two practice sessions, Newgarden had the quickest overall time. But in Saturday’s practice, Pagenaud, Dixon and Power all went even faster. Plus, top five drivers in the point standings were also the top five drivers in final practice (just in a different order). Since they were only separated by 0.44 second, it really could be anyone’s race among the contenders. So how does the championship race work? Sonoma is a double points event — one of only two on the schedule, along with the Indy 500. That twist could play a massive role in the outcome of the championship, because the points are soooo close. At a typical IndyCar race, first place is worth 50 points and second place gets 40. But at Sonoma, it’s 100 for first place and only 80 for second — a 20-point gap between first and second! That means Newgarden, Dixon and likely Castroneves (depending on bonus points) are all in situations where a Sonoma victory will mean the championship (which has happened the last two years). And really, Pagenaud isn’t in a bad spot, either (though he could use some help from his competition finishing off the podium). Power and Rossi are much bigger longshots at this point, even if they win. Newgarden has a series-leading four wins and eight podium finishes this season, but his lead is only four points thanks to a gaffe in the most recent race at Watkins Glen. After entering the Glen with a 31-point lead over Dixon — thanks to winning three of four races — Newgarden locked up his tires in the pits while avoiding teammate Will Power and slid into the guardrail. That cost him 28 points of his lead, which was whittled to just four. Dixon has just one win but has made finished on the podium seven times — second in the series. And he’s going up against the entire Penske team, which has been the most consistent this season. — Newgarden, who was totally fired up after his track-record lap to get the pole — his first since 2015 — is going into the race with a nothing-to-lose attitude. “If I drop the ball and totally ball it up this weekend, I’m still going to be pretty happy with this year,” the 26-year-old American said. “That’s not to say I’m going to settle for that or that I’m looking to settle for something like that. — Power, who qualified second, has a fast car but needs some help to pull off his second championship. 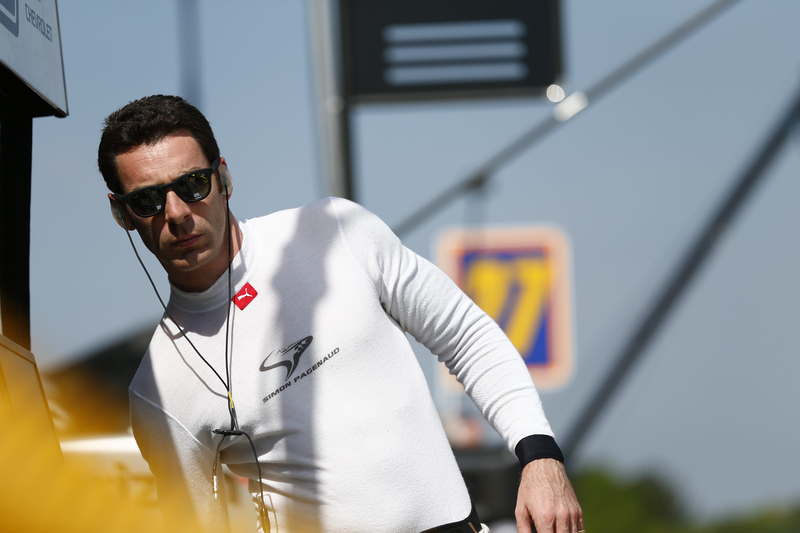 — Pagenaud, who won this race en route to the championship last season, is feeling confident after qualifying third. — Speculation about Castrovenes’ future has been swirling lately, but it would certainly be nice for him to pull off an improbable title at age 42. He’s in a virtual win-and-clinch situation since there it’s a double points race. — Dixon, the best driver of his generation, knows he has his work cut out for him. But it’s not like anyone can dismiss his chances.